I’m not a musical person. I mean I like music. But musical talent —playing instruments or singing— doesn’t come naturally to me. Until last fall, I’d never even picked up a stringed instrument and tried to strum it. 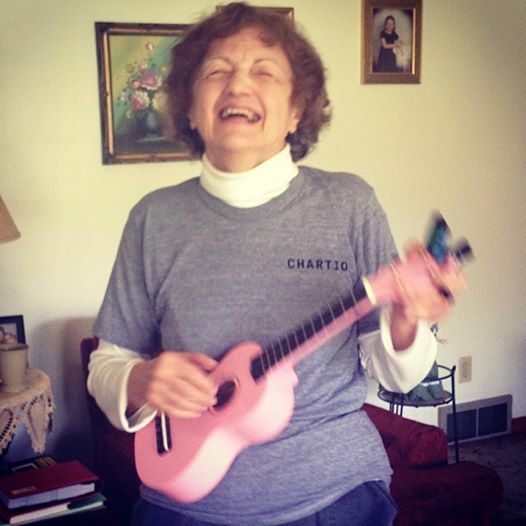 But when a pink ukulele magically came into my life, I really wanted to be the kind of girl who could play. I imagined how fun it would be to whip out my uke at a dinner party or beach bonfire and add that bit of charm, weaving a web of light, lovely tunes reminiscent of an evening in Hawaii on the lanai. Yeah, I wanted to be that girl. I took my first uke lesson and was completely overwhelmed. I couldn’t read the tablature (Um, I didn’t even know what tablature was! ), couldn’t make my fingers curl the right way to create chords, couldn’t strum without getting my thumb tangled up. It was a group lesson and other people seemed to pick it up naturally. By the end of the first class, I was still struggling to play a single chord and they were all playing and singing “Row, Row, Row Your Boat” like pros. I was discouraged, embarrassed, and ready to quit. When I was telling the story to my good friend, Laurie, she said, “Honey, listen: all you have to do is learn three chords and you can strum those chords and say some poetic words. Just that. If you do that, you will be a girl who plays the ukulele. Three chords? I can do that. (I think.) I set out on that mission. “C” was pretty easy. Just one finger holding down one string. (I stayed with “C” for a long time.) When I went to visit my family in Ohio last December, I took the ukulele, guessing I’d have lots of time to practice and maybe learn a new chord. I walked around my mom’s house plunking out that “C.” My niece, Nikki, and I sat on the couch and strummed crazily, making up goofy songs and pretending we were two ukulele-rocker girls on the road playing gigs. My mom laughed at us and acted as if she was our audience. A week later I was back in San Francisco and missing my mom. I got in the car one morning to go get groceries and when I turned on the radio “Moon River” poured out. Oh! I immediately called my mom to tell her that I missed her and that “Moon River” just came on and I thought of her. She said, “You really gotta learn that song on the ukulele.” We joked about that because of course there was no way in 1000 years I could learn that song. I was still struggling with my three chords. And while our family got lots of great talents, we both knew that the musical gene seemed to skip our clan. But something clicked that morning when I was driving home. I thought, “Wouldn’t it be awesome if I really did learn to play “Moon River” on the uke? I was going to be back in Ohio for Mother’s Day in May. What if I could surprise my mom? I got really excited. The idea took root. I listened over and over again to dozens of different people playing “Moon River” on YouTube. I searched all over the Internet for the very simplest tablature for the song. I painstakingly started to learn each of the ten chords in the song. I watched videos on learning how to strum. I practiced over and over and over again. And you know what? I still stunk. My fingers still stumbled and tangled and skipped and flopped. My voice was weak and wavering. No matter how many times I practiced, I couldn’t learn the chord sequence by heart. It felt like trying to teach a cat to cook scrambled eggs. But nevertheless, I just kept trying. Even though I was not very good, I could begin to imagine being that girl who could play the ukulele! And every once in a while when I would talk to my mom on the phone, she’d joke about me learning how to play “Moon River.” But I knew she never in a million years would guess that I might actually do it. Even though I totally stank at my efforts, the joy of trying to learn it for her was truly great. I got so happy inside whenever I thought about actually showing up on Mother’s Day and playing it for her. So I wish that the way the story ended is that I could tell you I pulled out the uke in front of my family and started strumming and it was amazing how great it sounded. I wish I could tell you I sang so sweetly that it made my mom cry. I wish I could tell you that I felt exactly like I had hoped I would — confident and fun. The truth is, even after all that trying, I kinda sounded like a fish with a cold that was trying to strum with his flippy-floppy fins. My fingers missed some of the chords and I was focused so hard on trying to play the darned uke, that I sometimes forgot I was supposed to be singing. I was gawky and awkward and out of tune. But you know what? It didn’t matter that I wasn’t that girl who can play the ukulele. 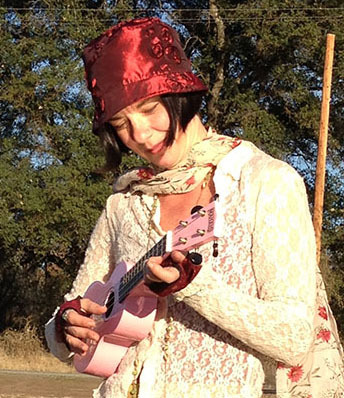 Because I was the girl who tried to play the ukulele — for her mom. I was the girl who spent hours and hours attempting something because I wanted to give my mom a special gift. I wanted to make her smile. And if you’ll check out the photo, you’ll see that my mom did, indeed, smile. I think she understood that I tried my best and put my whole heart into wanting to give her a memorable gift. And just so I wouldn’t feel so bad about my own playing, she gave the ukulele a whirl. She pretended to sing and she strummed like crazy and she even raised the uke over her head and banged out crazy chords like a rock star! We all had a blast. I’d still love to be the girl who can play the ukulele. And I’ll keep trying. But you know, I realized that what is even more important to me is to be the girl who tries her best to give gifts that hit the right note. And I do feel like that girl. P.S. My mom says that I keep posting really bad photos of her in these newsletters. But I think they are awesome. She is SO much fun to be around and her spirit shines through. Don’t you agree? PPS: I’m way too embarrassed to post a link to me singing “Moon River.” But here’s a link to Audrey Hepburn playing ….